The Speedwell-Jackpine community in Saskatchewan, north of North Battleford and east of Lloydminster, attracted both American and Russländer Mennonite families. Most of them were Mennonite Brethren (MB), and they organized a church in 1926. In 1936 the church consisted of 114 members from forty families. The congregation closed its church doors in 1948 because nearly all the families had moved away. 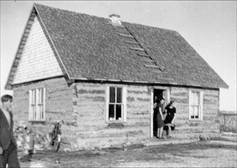 Yet within that period and with limited resources, the Mennonite Brethren conducted a Bible school, beginning in 1937. During those pioneer years, when public education was often limited to a one-room classroom for the lower grades, it seemed all important to have a Bible school for the young people. Becoming conversant with the Bible for personal spiritual growth, for service in the church or in home mission, or even for mission work abroad, were compelling motives in most MB congregations during pioneer years. It was simply too expensive for most to send them to the closest such schools -- Hepburn and Dalmeny. It was much less expensive to import a teacher. The first teacher, appointed in 1937, was George Thiessen, probably a graduate of Bethany Bible School, Hepburn. Assisted by his wife, Elizabeth (Lepp) from Dalmeny, he conducted the first class in a residence owned by Bernard Harms. They enrolled sixteen students, teaching courses adapted from those at Hepburn, where George W. Peters was principal. Thiessen taught Bible and his wife Elizabeth taught "personal work," where soul-winning was the ultimate object. In 1938-39 Daniel Wirsche, a graduate of Bethany, was appointed as a second teacher. A single man, he married one of the students, Elsie Fiedler. When Wirsche left to teach at Hepburn, the school closed, perhaps for lack of a suitable building. But the donation of two acres for the church by Pastor Jacob A. Enns made it possible to build a log house for the Bible school in 1940 . When the school was back in operation during 1941-1942, Abe Goertz from Dalmeny Bible school taught until he was called up for war service. He was replaced by Menno Lepp, a Hepburn graduate, who had nine students in attendance. As people moved away, mostly to Alberta and BC, the community declined, and the student numbers also declined. Only one or two Speedwell attendees continued Bible studies for service in the church or mission. One of these, Mary Loewen [Fehr], remembered that instruction was primarily in Bible and catechism, but she remembered it as a "precious time." Fehr, Mary (Loewen) Fehr. Youth, School, Farm, Church in Speedwell, SK. Private, 1979. Fehr, Norman. Homeward Bound and Family Bound Life Story. Private, 1994. Missionary Album. Board of Foreign Missions of the General Conference of MB Churches, 1954. Penner, Peter. "Speedwell Bible School (Speedwell, Saskatchewan, Canada)." Global Anabaptist Mennonite Encyclopedia Online. Summer 2001. Web. 21 Apr 2019. http://gameo.org/index.php?title=Speedwell_Bible_School_(Speedwell,_Saskatchewan,_Canada)&oldid=113042. Penner, Peter. (Summer 2001). 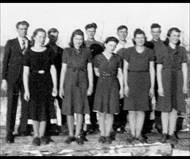 Speedwell Bible School (Speedwell, Saskatchewan, Canada). Global Anabaptist Mennonite Encyclopedia Online. Retrieved 21 April 2019, from http://gameo.org/index.php?title=Speedwell_Bible_School_(Speedwell,_Saskatchewan,_Canada)&oldid=113042. This page was last modified on 17 February 2014, at 04:36.